Although this game is called D.N.D it’s not the classic role playing game Dungeons and Dragons. Instead it’s a fast action side scrolling shooter where you defend a small settlement of earthlings from hoards of aliens. It’s a 176×220 non-touchscreen game so its best on older or low end phones with a suitably small screen. Publisher’s description: DND is an action rich game sets you on an honorable mission of freeing small Earth settlement from an alien attack. Armed in the beginning with only a gun and a knife you have to fight masses of aliens and if you’re not smart enough you might never help Bersville settlers. 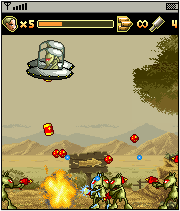 The side-scrolling shoot-em-up features several tough missions all set in different locations including jungle, empty village and underground alien base. Throughout the missions you can collect first aids to revive your character as well as various types of heavy weapons, including a huge plasma-gun, to help you stand up against the enemies. The app “DND Lite” (206 KB) is ready to download or send to your phone as filename:”dnd”. is there a 240×320 screen size for this game ? You need to find out if you phone supports Java ME apps. If it does most of the games and apps on BoostApps should work. If it doesn’t none of them will. Check the phone manual or manufacturer web site. why can’t i download in my phone torque droidz buzz with free data?? Can i please get this app witi the screen size 240*320 have found several other sites with this .jad but they all give the data error and this one is in the corner of my screen. Please I’m begging!!! Try using the Universal App Loader to fix the version that gets the error. On an 840G it appears to get stuck at the “synch to server” screen. After clicking Start click the top right button and choose Goto Game to get past that. Onscreen nav keys don’t work and the game screen is left of center. It does look pretty nice (similar to Metal Slug), but with the bottom row of number keys it’s not really playable on that phone.